After a day-trip to Movie World, and then a slight distraction by Eurovision, I had a quick look at Facebook before going about my evening chores. Upon reading Dr Leaf’s latest social media meme, I was aghast! Dr Caroline Leaf is a communication pathologist and self-titled cognitive neuroscientist. 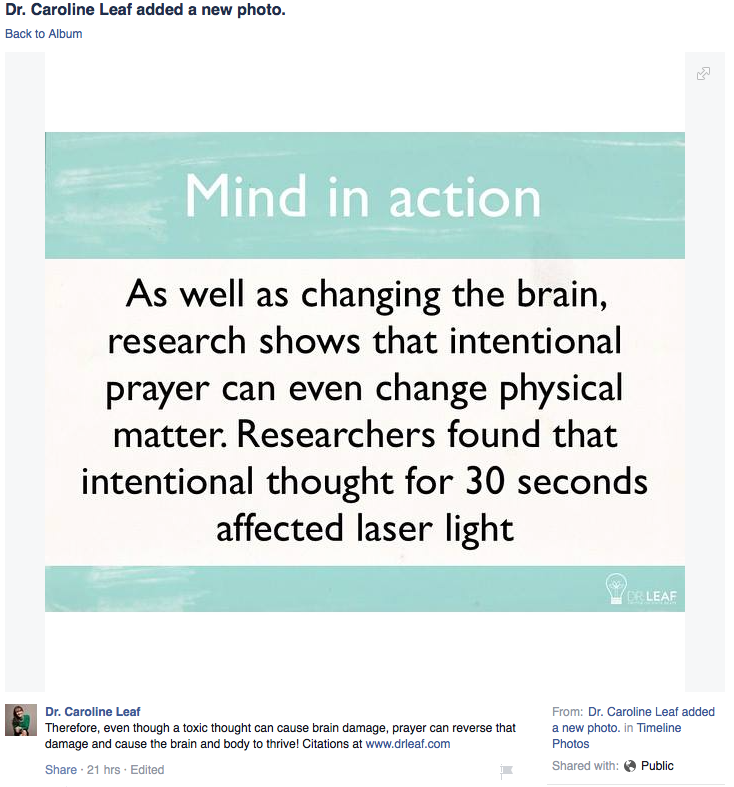 Hiding in amongst her “Scientific Philosophy” was this juicy factoid: “Researchers found that intentional thought for 30 seconds affected laser light.” This is, apparently, also proof that prayer can change physical matter. I actually thought it was God that changed physical matter if He agreed with our prayer requests, and not our prayers themselves, because if it was simply our prayer, then we wouldn’t need God. That’s probably a blog for another time. Still, it was her last statement that caught my attention. Intentional thought can change the properties of laser! I’d never heard that before! I had to find the references. It turns out that the paper Dr Leaf is referring to is, “Testing nonlocal observation as a source of intuitive knowledge” . In this experiment, Dr Dean Radin, a paranormal researcher, took 5 “experienced meditators” and 5 normal control subjects, and asked them to mentally interfere with a laser beam pointed at a light-reading CCD sensor inside a sealed box. He averaged out the intensity of the light pattern that was read by the CCD. He believed he found a difference in the amount of light that was read by the sensor when the meditators “blocked” the laser light compared to non-meditators and control runs. In his original paper, Radin published the following graph of his results. 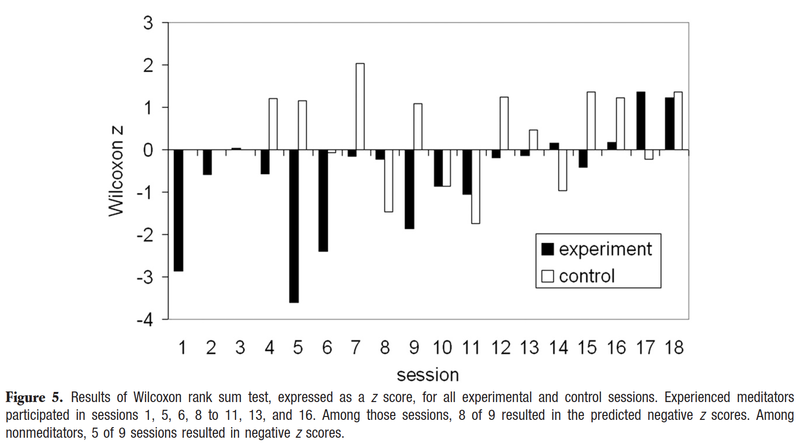 The length of the bars represent a statistical value based on the results, not the actual results of the experiments. The simplest explanation is that the further down the bar goes, the greater the degree of interference to the laser light. Radin believed the effect was caused by the meditators literally interfering with the quantum mechanics of the photons in the laser beam, “observing” them from outside of the box, thus causing their wave function to collapse and stopping them from reaching the sensor. However, notice that the first few experiments show a large effect, but that this diminishes as the experiments go along, and towards the end, the control groups and the meditator group is actually about the same, with no interference to the laser light at all. This effect is called the Decline Effect, and is common problem amongst studies of the paranormal. It’s a result of a phenomenon called ‘regression to the mean’, or in other words, the more times you perform an experiment, the more likely the results will line up with the true average. I think in Radin’s case, it also had a lot to do with his own expectations. So, Radin probably caused the effect by wanting to see it. He excluded data that didn’t suit his hypothesis, citing a technical issue with the equipment, and instead focussed on the data set that still seemed to fit. He also performed the analysis of the data, which he biased with his own pre-conceived notions. The other nail in the coffin for this paper is that it was a pilot study that was done by one researcher, which no one has since tried, or succeeded in, replicating. Indeed, the methodology for this research was based on a series of experiments done by a real physicist with better equipment, Professor Stanley Jeffers, a professor of physics at York University in Toronto, Canada, who performed the experiment about 74 times and found no effect . So, Dr Leaf has cited this isolated, error prone, biased and unconfirmed paper of Radin’s as proof of the ability of thought to change physical matter, and indeed, as prayer’s ability to change physical matter. This is simply more proof that Dr Leaf is prone to rush in where angels fear to tread, and latch on to any “research” that supports her ideas, no matter how tenuous or unscientific. She did the same thing when she cited a conference poster from a paranormal conference in the early 90’s, and claimed it was definitive proof that our thoughts can change our DNA. In actual fact, the paper was so full of flaws [3: Ch 13, The “ingenuous” experiment] that the only thing it could show was how desperate Dr Leaf is to try and justify her unscientific pet theories. This tendency for Dr Leaf to rely on such poor science, and link it to fundamental Biblical concepts, dishonours science, the truth of the Bible, and her audience. I think Dr Leaf would be wise to review her scientific philosophy and the “research” that she uses to justify it, rather than continuing to utilise tenuous and inaccurate articles from studies of the paranormal. Radin D. Testing nonlocal observation as a source of intuitive knowledge. Explore 2008 Jan-Feb;4(1):25-35. Pitt CE. Hold That Thought: Reappraising the work of Dr Caroline Leaf. 1st ed. Brisbane, Australia: Pitt Medical Trust, 2014. This entry was posted in Biological, Caroline Leaf, Psychological and tagged caroline leaf, criticism, Dean Radin, Decline Effect, double-slit, Dr Leaf, Eurovision, Facebook, laser, paranormal, prayer, pseudoscience, regression to the mean, thought, toxic thought by cedwardpitt. Bookmark the permalink. What about the “double slit particle experiment;” when particles turn into waves or vice versa once they are “observed?” Anyway, I don’t think she should have quoted the Radin experiment. I wish she would just do more of her own research. And if she doesn’t know something that rely on faith and sound doctrine and solid testimonies of answers to prayers. Hi again Brandon. I’m not sure what your background is. I tend to ‘understand’ quantum mechanics on a conceptual level. My understanding is that the double-slit experiment demonstrates that any subatomic particle, be it electrons, photons or whatever, have properties of both waves and particles at the same time. The electron or photon isn’t a smooshed out particle which acts like a wave, but has both the properties of a wave and a particle simultaneously. The Copenhagen interpretation suggests that the collapse of the wave function of the particle only occurs upon observation. Not every physicist agrees with the Copenhagen interpretation, and there are competing theories (like the many worlds hypothesis for example). As weird as it is, the double slit experiment is a repeatable phenomenon, which can be done with the simplest equipment and observed by everyone. What Radin is suggesting is that those ‘experienced mediators’ were able to change the properties of the photons even before they were observed, which is a step beyond, and as was proven by Prof Stanley Jeffers, and even by Radin himself, was that the Radin experiment was not repeatable. Radin and the double-slit are different on every level. So, I think you’re right, Dr Leaf shouldn’t have used Radin’s ‘research’, and the fact that she did demonstrates a deficiency in Dr Leaf’s capacity to determine what is quality science as opposed to junk, or that she’s so desperate to find some corroborating evidence to back up her fanciful claims that she will use junk science like Radin’s paper. Either way, it only undermines her credibility, and she would be wise to review her teaching and its scientific basis. That is what concerns me about how she chooses citations. Ye,s she could instead say somethings like this; “well, some scientists believe that simply observing ‘matter’ can actually change it’s physical appearance…. consider the double-slit experiment. So, if our mere observation can effect tangible things, how much more will our prayers and actions bring results.” Personally I am glad for her joy and knowledge of the Scriptures, but agree with you that she almost would be better to use some ‘near death’ experiences that glorify God, instead of experiments where scientists are trying to get people to move things with there mind etc.